NEW YORK (ForexNewsNow) – US Federal Reserve Chairman Ben Bernanke’s speech today at the Jackson Hole economic conference in Wyoming continues to capture the attention global markets. The Federal Reserve Chairman will be joined by European Central Bank President Jean-Claude Trichet at the annual economic summit. 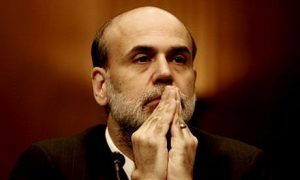 Bernanke’s speech, which is scheduled to take place today at 14:00 GMT, has been the subject of intense speculation and anticipation. At last year’s Jackson Hole conference Bernanke announced the introduction of a second round of quantitative easing, popularly referred to as QE2. The mediocre results of QE2 fueled speculation that Bernanke would introduce a third round of quantitive easing this year, yet expectations have slowly been receding in recent days as many analysts argue that it is highly unlikely that Bernanke will introduce QE3. Despite the faltering hope of an announcement on QE3, investors still expect the Chairman to pledge that the central bank is willing to move in to support the faltering recovery and introduce other options to stimulate the economy. But not everyone is convinced that Bernanke will be able to meet the high market expectations. While market’s picked up early in the week due to confident predications that the Fed chairman would unveil a third round of quantitative easing, the recent fall in expectations have negatively impacted the week’s early gains. US economic news has continued to show poor performance as a report released today shows that the US’s gross domestic product grew at a 1.1 percent annual pace in the second quarter, down from the 1.3 percent rate that the government estimated last month. US initial jobless claims were also less impressive than expected at 417k, and there were upward to revisions to both last week’s initial and continuing claims readings. On the Forex markets, the USD has gradually decline from yesterday’s rally with EURUSD recovering from 1.4328 lows to 1.4429 today, and USDJPY falling from yesterday’s 77.70 peak to 77.20. The initial USD gains were led predominantly by the stock market turning lower – and exacerbated by the news that France, Spain, Italy and Belgium would extend short-selling bans on banking stocks until the end of next month. Will Bernanke’s Speech Reassure Or Scare Markets? Overall many analysts believe that Bernanke’s Jackson Hole speech will not provide the clear guidance that many market watchers wish to see, and at best, will contain words of comfort and support, with very little concrete action. The rising inflation in the US coupled with the changing political climate in the US, led by presidential candidate Rick Perry and the Tea Party movement which are fiercely opposed to recent Fed policies, make’s the chances of any sort of large Fed intervention much more problematic. While analysts continue to express various opinions on the ramifications of the speech, their has been some reluctance on the part of traders to engage in equity and currency market moves. Major Asian indices are currently showing very slow movements with the Nikkei currently positioned at +0.3%, the Hang Seng at -0.1% and Shanghai Composite at -0.5%.